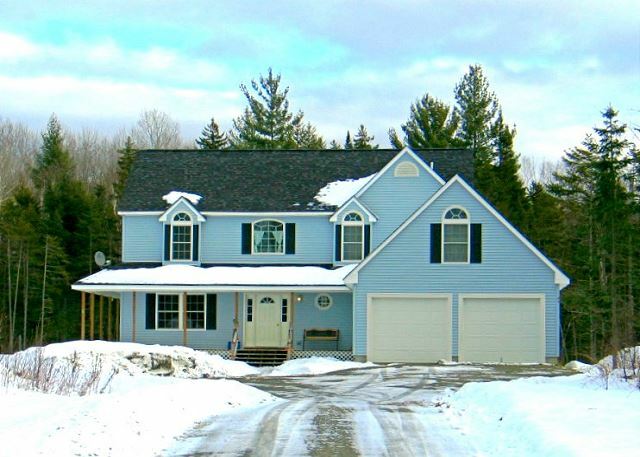 This home will make you feel like you are miles from everything, yet you will only be a short 5 minute drive from Franconia town center and Franconia Notch State Park! The perfect secluded home away from home! A glance down Far Far Away's drive at the beginning of our famous Fall foliage. 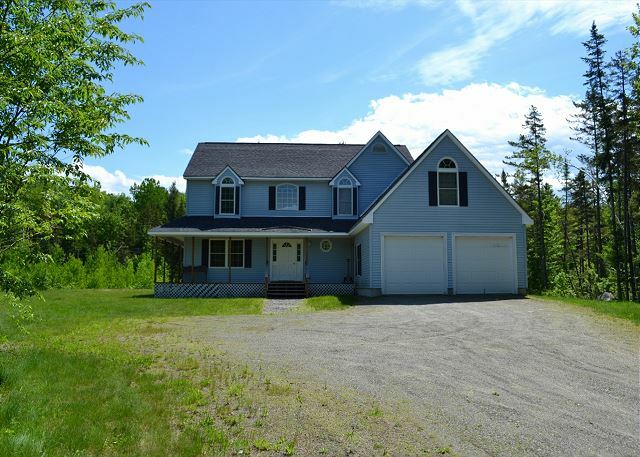 Come see this 4 bedrooms, 3 bathrooms, sleeps 10 home today! The home opens up to a large entry way/mudroom, with stairs to the second floor directly ahead, bedroom #1 to your left, and the entry to the dining/living areas and kitchen to the right. Main entry way - door to the garage and the main floor bathroom are straight down to the right. Offering plenty of room for everyone at the dinner table, this is where families will be able to re-connect over an enjoyable home cooked meal. Bedroom #1, first floor. Features a queen size bed, lots of windows for tons of natural light, and A/C unit in Summer months. 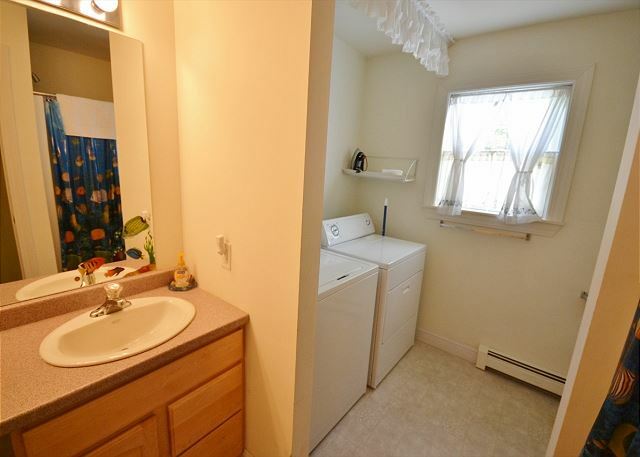 This first floor 3/4 bathroom also houses the washer and dryer. Looking toward the living area as you enter the kitchen; which features a convenient work desk should you need to mix a little business with pleasure. Kitchen looking into the living area, with sliding glass doors that open onto the back deck. 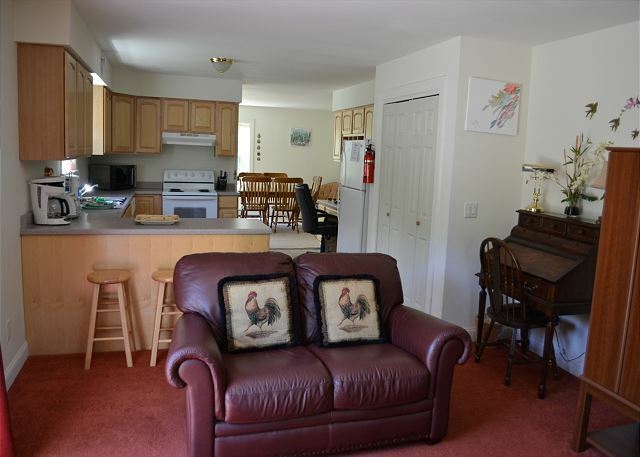 Here's where the family can sit and relax after a long day of skiing or exploring Franconia Notch State Park and the greater White Mountains regions. Make your reservation today! The kitchen is centrally located between the dining and living areas, with access to the deck on the other side. Bedroom #2, second floor. 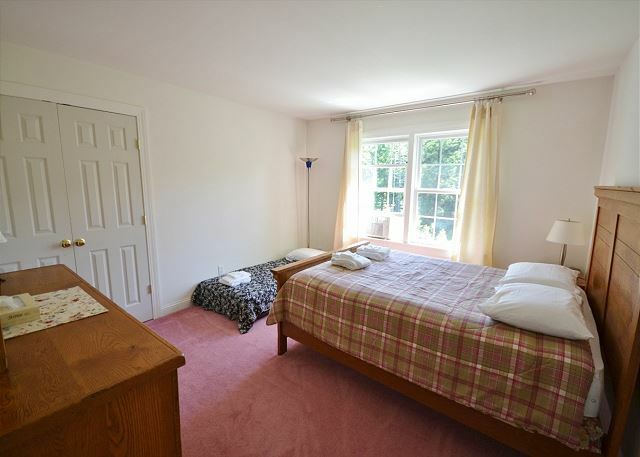 Clean and comfortable, features a queen bed and an additional twin bed. Bedroom #3 second floor, also with both a queen and twin bed. Bedroom #4 Master, with queen bed and en suite full bathroom. A Professionally Managed Franconia Notch Vacations Property, this newly constructed Franconia Mountains Country Home enjoys a tranquil setting "Far Far Away" from it all, yet you will only be minutes away from Franconia Town Center, Cannon Mountain Ski Area, Franconia Notch State Park, and all of the best of New Hampshire's White Mountains. Nicely appointed with queen beds throughout, and with 3 bathrooms there will be no waiting. 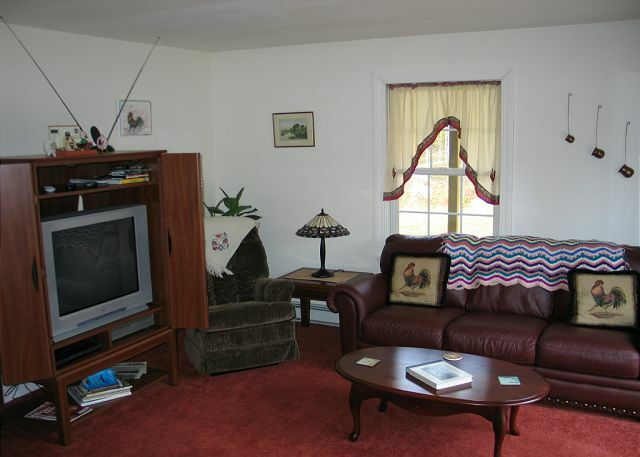 Enjoy all the comforts of home - maybe more! It's all brand new and waiting for you. Call and reserve your good time today. My wife and I celebrated our wedding anniversary in Franconia this year after an event we worked in Bath, NH. We brought our 6-year old and 8-month old daughters with us. The house was very large and comfortable for us. 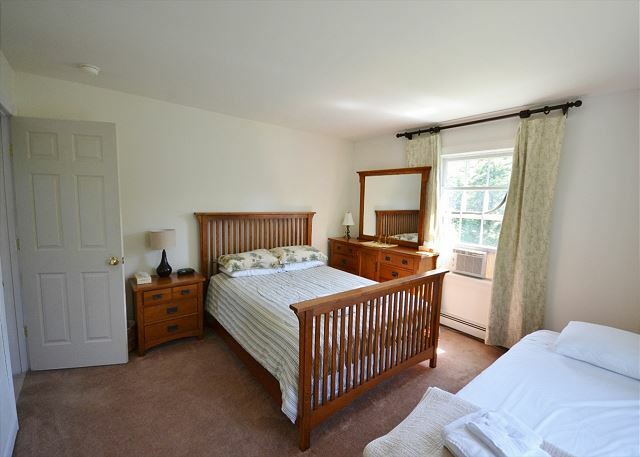 We used two of the bedrooms, each with a queen bed and single bed on the second floor. We each enjoyed a relaxing soak in the jetted bath tub in the master bedroom. The water was nice and hot! My wife loves to cook, so we were prepared with some meals and snacks to enjoy at the house and in the evening before dinner we relaxed with snacks and drinks on the back deck. For dinner we drove 5 minutes into Franconia center and went to Joe's Catering for BBQ. For breakfast the last morning we went to Polly's Pancakes. There was a 2 hour wait, so we wished we woke up earlier, but it was worth the wait. We left and went back. The house was excellent and Cort was wonderful to work with and very accommodating. This rental was perfect. When looking for a property our top concern was finding a rental that would allow our two well trained German Shepherds to be with us. We were also looking for a few extra bedrooms as we had guests coming from Finland and NC & Virginia. The space worked out perfect. The house was clean and played out perfect for our needs. The location was also perfect tucked into a spot surrounded by trees, we were able to take our Shepherds out to play supervised. The house was also at a central location for all our needs. Thank you and can't wait to visit next year! The place was spotless and large enough to accommodate 2 families and kids had plenty of space to run around in. One of the rooms was filled with toys, much to the delight of the kids! Plenty of space to spread out and nice slecuded spot nestled in the mountains. Came back feeling refreshed. Great location for fall color foliage. awesome vacation, as the manager always makes sure of that, he always goes above and beyond! We have rented this house for the past few years and have enjoyed our winters here. It is a great family house and place to gather after skiing. It is clean and efficient with space. Heated garage is always nice in January. had a awesome time as usual! Had a great vacation very quiet and relaxing. Property manager I rate a 10. It was a very private beautiful get away for my family. I enjoyed every minute of it. We enjoyed5 our stay in Franconia, NH this year. Highly recommended. Lots of privacy, comfortable and spacious. Franconia's Far Far Away was true to its name in feeling. You feel as if you're off the end of the earth with nary a sign of human life in sight. And yet, once you navigate the car out of the back country roads, you're a short distance from Littleton and its convenient shopping (we even got some great buys on shoes at TJ Max) and close to Franconia's beautiful sites. The only disappointment was that we didn't see any bears! The house was pleasant, clean and very comfortable. The only thing I would have done differently was providing comforters as opposed to blankets and flat sheets. Also, the walls could use some color instead of flat white. But these little things didn't hamper our enjoyment of all the space, charm, and conveniences of the home. We had a great time! Wonderful place. Plenty of room for our 3 families and kids. Well off the road for kids to run around and play, close enough to town for convenience. 20 minutes from Lafayette for our hike. We had a wonderful time and so did our kids. It was a beautiful home and we would love to come back again. Thanks for the great feedback Mr. B!! We will be happy to have you return anytime, perhaps ths next time being this fall when all the Autumn colors are popping! Enjoyed our time at Far Far Away Franconia! A Mountain Retreat We enjoyed some cooler weather while folks at home were sweltering in 100 degree temperatures. Our family had some good hikes up into the mountains during our stay. We had some delicious meals cooked on the grill on the deck. All the facilities were in good order and we appreciated the way thwe house has been kept. This was the Whitfield's 3rd year staying at Franconia's Far Far Away... always so great to hear positive reviews from our long-time repeat guests! Was great to see you and all the family again this year David! Thanks always. Far Far Away from it ALL! 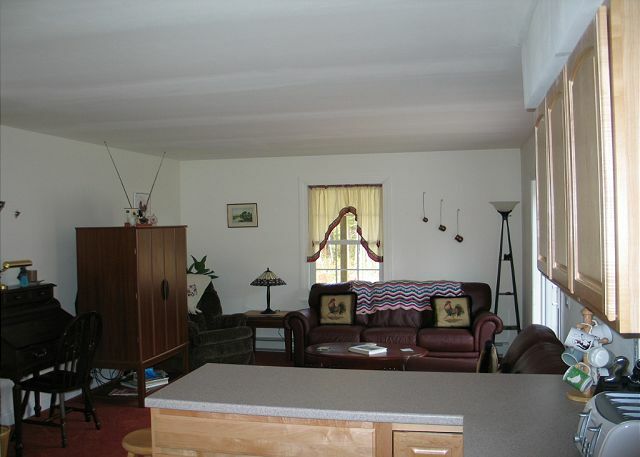 We were very satisfied by our experience with Franconia Notch Vacations and this property. This is our second stay and FNV always goes out of their way to insure the best vacation. I would reccomend this to ANYONE! A Great Family Escape is what we enjoy at Far, Far Away with part of the family visiting with us each of the two weeks. We enjoyed having the bear visit us in the back yard on several occasions. We all stood on the deck and watched him munch on the berries.